As per RBI guideline from 1st December, 2013, ATM PIN will be mandatory for purchase using debit card. Prime intention here is to make your debit card transaction more secure. Earlier we use to give debit card at retail outlet and merchant use to swipe the card to complete the transaction but now additional security layer is introduced you need to enter your PIN to complete the transaction. After making purchase you need to handover Debit card to merchant. 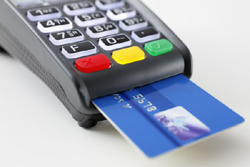 Step -1 – The merchant will insert the debit card in to PIN enable POS terminal and enter the amount paid by you. Step -2 – The POS terminal will ask for ATM PIN. Step -3 – Enter your ATM PIN on POS machine. Step- 4 – On completion of transaction merchant will handover transaction slip and debit card to you. Never disclose your PIN to anyone/merchant. When you are entering PIN make sure no one able to view/guess it. Change your Debit card PIN at regular interval. Keep watch on debit card when you handover it for payment. If you enjoyed this article, share it with your friends and colleagues using facebook and twitter.